It's Friday afternoon, you've made it through the long week, and it's time for Happy Hour, Gizmodo's weekly booze column. A cocktail shaker full of innovation, science, and alcohol. Ooh baby, let's get drunk. Step 1: Empty a bag of gummi bears into a container. Step 2: Pour in enough vodka so that the gummis are completely covered—and then some. Step 3: Cover the container, put it in the fridge, and leave it for 3-5 days. That's it. There's no way that could work, right? My hangover says otherwise. 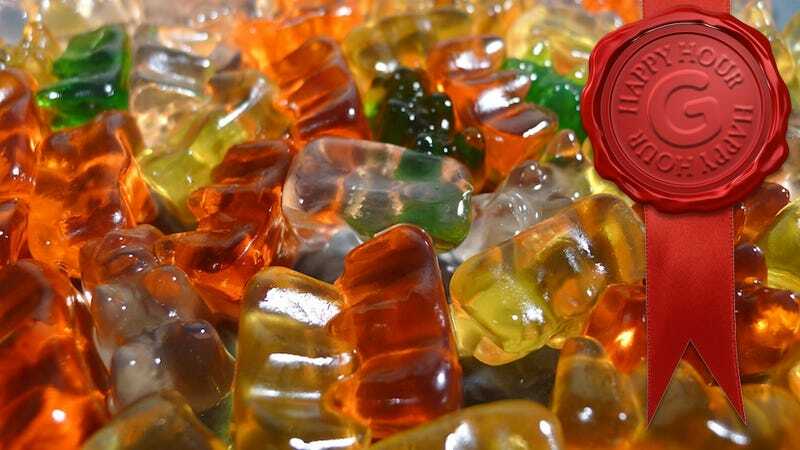 For my experiment I used a bag of Haribo Gummi Bears and some very tasty Tito's vodka. After three days I pulled the gummis out. They were significantly bigger, as you can see in the photos with the tape measure. I popped one in my mouth, and there was that unmistakeable high-proof alcohol burn. These things are strong. And the texture had dramatically changed. It no longer had the gummi chewiness—it was more like a very firm Jell-O, and you could almost slurp them. Yes, small, bear-shaped Jell-O shots. They weren't quite "done" after three days, though. They still had a harder gummi core, so I put them back in the vodka, and let them go for another two days. Half a bag gave me a pretty decent buzz. I have no doubt that the sugar in the gummis adds to the effect. It may also be because you're holding the booze in your mouth longer as you chew and explore the texture. Regardless, I was all warm n' giddy. The solid core was gone. They were bigger, jigglier, and a bit smoother going down. That brings me to an important note: these don't taste like gummi bears that happen to have booze in them. No, they taste like vodka with gummi bear flavoring. Not really my thing, but I was won over by the novelty. So why not try it with other spirits, right? My second round, I used Jameson's Irish whiskey, Cornelius applejack, and Mansinthe absinthe. They were all pretty good. The whiskey and applejack batches were both very sweet, but pretty mild. The absinthe batch was very absinthey. Hard notes of licorice, lots of burn, and they kind of turned white-ish (see photo). A neat experiment, but I'll probably stick with vodka next time. Click through the photo gallery for a full tour. And check back next Friday for more Happy Hour. Thanks to Eileen for the recommendation!